Jordan Auto Body is located in the Humboldt Park area of Chicago, Illinois. We have been at this location for over 20 years with 100’s if not 1,000’s of satisfied customers. Most of our customers are repeat customers who refer new customers to Jordan Auto Body. Training – Our staff are constantly updating their skill sets to make sure we stay current with new technology and new repair methods. Our Professional Painters are in training at least 2 times a year to stay current with the new colors and technology in the Automotive Painting Industry. Quality – Our staff uses a repair process, refined in-house, to make sure we get the desired results and then exceed those results. Our Quality Assurance staff uses manufacturers specifications to measure the results of the repairs for both body work and painting. We are constantly striving to produce better and faster results for our customers. Customer Satisfaction – Jordan Auto Body focuses on Customer Satisfaction at every step of the repair process. Our technicians, body men and painters are constantly monitoring your vehicle to make sure that we get the job done right the first time. Our customer satisfaction is evident by our repeat customers and their willingness to refer customers to Jordan Auto Body. Our online presence and online reviews confirm our level of customer satisfaction. Results Driven – Jordan Auto Body is driven by our customers expectations. We take our time to explain every step of our repair process to all interested customers. We strive to make sure we exceed our customers expectations and that the results our customers expect are exceeded on every level of the repair. Competitive Costs – Jordan Auto Body is constantly monitoring the cost of OEM parts and aftermarket parts to ensure that we provide the most cost effective solutions for our customers. We monitor the cost of the highest quality parts with the best reputation in the industry. We pass the savings along to our customers to provide them the value they expect from Jordan Auto Body. Limited Life Time Warranty – Jordan Auto Body provides our customers with a warranty on our Body Work and our Professional Paint Services. We stand behind our work and put our warranty in writing for you to examine. Contact Jordan Auto Body for all of your collision repair needs. You will find out why we have been in business for over 20 years in the same location. And you’ll find out why our customers always return to us when they have collisions in the vehicles. You won’t be disappointed by the speed, cost and quality of the collision repairs our Body Shop provides. 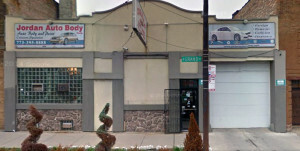 (taken from my Yelp review): an autobody shop that won’t make you sick and kill you! (please forgive this poorly placed arrested development reference…) but for serious – the other week, in my mad rush to go buy doughnuts, i backed my car into a pole in my garage. 4 of my neighbors witnessed this moment of idiocy. it was great. the damage was prettttty pretty bad, a very ugly dent and scratch on the side of my car. my husband inspected it and figured it’d be close to a thousand dollars to fix and so i decided that that money would be better spent on doughnuts and began the process of coming to terms with driving a hurt car. but then i heard about bodyshopbids dot com – greatest invention ever. i sent in pictures of my car, filled out a report, and waited for bids from body shops around the city. GENIUS (no, i don’t work for these people). jordan automotive was the winning bid, coming in a good $150 dollars under the other bids i received (at only $300 dollars – yes!!! ), and after consulting with the bodyshopbids guys, who assured me that jordan automotive would do a great job, i went with them. from then on, everything was a cinch. i dropped my car off with leroy on a friday and picked it up on monday, a day early. the work they did was perfect, and they even touched up the spots on my bumpers from all the stellar parallel parking i do around the city. AND they washed my car. so all in all, yeah, i’d say i’m pretty excited about these guys. 5 stars all the way.